How Much Does Asphalt Repair Cost? Spring has sprung, and that means it is time for asphalt repair. So you may be asking yourself, how much does asphalt repair cost? When we calculate the cost for asphalt repair jobs, each job can vary significantly. Not only are there multiple methods of repair, but also an unlimited number of scenarios that don’t factor in easily, like traffic control, etc. But to simplify the process some, one of the metrics that everyone can understand is the square foot price, or for you math majors (=total price/total repair area). You may think the square foot price is a great way to measure one contractor against the other…but is it really? 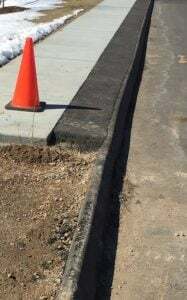 The most limiting factor in strictly using that metric when determining your asphalt repair cost, is not considering the depth and method of the asphalt repairs being performed. In commercial pavement, the depth of asphalt can be as little as 1″ on a poorly paved parking lot, or more than 9″ on a municipal or state road. 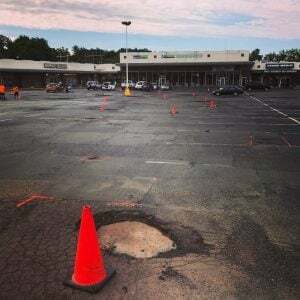 For our purposes here though, we can, and will assume the majority of parking lot asphalt projects are between 2″-4” in depth, and we’ll assume the method being utilized is full depth saw cut patching. This is your ‘by the book’ scope of work for the repair and replacement of areas of severely deteriorated asphalt. On average, you can expect to pay anywhere from $4-$12 per square foot for saw cut patching work, depending on the total workload and myriad of other regional factors. Keep in mind when calculating your asphalt repair cost for very small jobs, these per square foot numbers won’t apply. Hot mix asphalt plants typically require a minimum purchase which varies by location, as well the paving contractor’s minimum service charge to cover costs. Although not an exact price, you can expect a reasonable minimum charge for hot asphalt repairs to be in the $600-$1600 price range. Winter has come to an end and we know your pavement has taken a hit from the harsh effects of snow and snow removal. Unfortunately, your curbs will take the biggest beating from the plow. On average, a curb repair will cost around $8-$18 per foot. It’s officially spring, and that means parking lot asphalt repair should be a big priority. Winter damage left unfixed can lead to liability concerns like slips, trips and falls, complete deterioration of your parking lot, and an overall decrease in curb appeal. When accounting for the cost of your asphalt repair, we can assess your property to evaluate the repairs that need to be completed, and provide you with an exact price. Please use the above generalized estimations as a starting point, but understand that each project varies significantly due to a number of factors that we cannot assess until we see your property. Now is the time to have your property inspected and to schedule all your repairs for the warmer season! The best way to proactively protect your paving investment and your tenants is by having regular inspections performed by your professional pavers, and conducting regular maintenance. Crack filling, pothole repair, patching, and sealcoating are the most effective ways to protect your asphalt pavement to make sure that you are getting the most out of your investment. When considering which paving company to select, take into account the importance of proper installation, and that this installation quality, as well as use of good materials, will directly correlate to the length of your pavement’s life. The cheaper and thinner your pavement is, the less likely it will last as long as it should. For any and all of your asphalt and paving needs, contact EastCoat Pavement to get your free consultation!